Gallardo Does it All ~ The Bucky Channel - The World of Sports from Wisconsin's Perspective. Yovani Gallardo not only pitched awesome Saturday night, he also hit a solo homerun that was half of the Brewers total runs as the Brewers beat the Padres 2-1 Saturday night in San Diego. 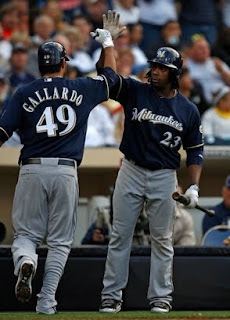 Milwaukee won their first game since Gallardo's last start, which proves that someone else on this team has to step it up if they want to make a run. Also, it was good to see Rickie Weeks hit a long ball, after he has just been on a cold streak. Saturday was Rickies first two hit game since April 23rd. He needs to get on for people to hit him in, but everyone of late hasn't been hitting much. Gallardo still had a high pitch count for seven innings, but he did strikeout 11 guys. He gave up 6 hits, 2 walks, and one earned run. Since his slow start he has really come around of late. He is really starting to strike out some batters, and he has kept the ball in the ball park too. That is what always seems to kill Yovani when he either hangs his curve, or his fastball location is off. He has won his last three starts, and he has 25 strikeouts in those starts. Lets hope this is the start of something special this year for him. As far as the Padres go, Tony Gwynn Jr. scored the only run for them. He isn't having a good year at all, but somehow this team is still winning. He is batting .235 in the leadoff role, and everytime I see him bat he was striking out. Chase Headley was their main source of offense as he had three of the Padres seven hits. This is not a hitters ball park so these 2-1 games are seen a lot. POTG goes to Gallardo for sure no questions asked.